The Bastide of Duras is an historic market town that lies on a hillside along the river Dropt. The Chateau de Duras overlooks the valley and its beautiful landscape of rolling hills. Chateau des Ducs du Duras circa 1137 castle that overlooks the river Dropt. The chateau was purchased by the town of Duras in 1969 and sympathetically restored over 20 years to its original state. Today, laser technology brings the chateau to life with troubadours, knights and ladies, and the music of the great hall. Le musée de l'outil ancien à Soumensac - this museum consists of over 1000 ancestral tools. Free entry. Boulangeries (bakeries), markets, supermarkets, chemists, banks, Exchange Office, post office. Duras offers excellent shopping. Venture out early morning to one of several bakeries to buy your fresh baked croissants and breads or wander through the fresh produce stalls at the local market on Mondays (open until noon). Wines in the Aquitane wine region ~ A variety of grapes are grown throughout the area including White: Colombard, Sauvignon Blanc, Sémillon, Muscadelle, and Ugni Blanc; and Red: Cabernet Franc, Cabernet Sauvignon, Malbec, Merlot, Petit Verdot. Online map from GoogleMaps. Click here for the local street map of Duras. 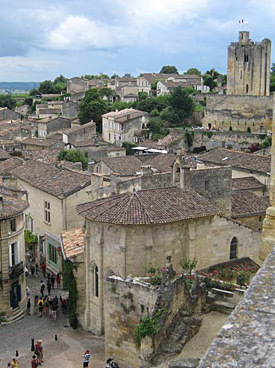 Airports - Bergerac is only 40 minutes from Duras, while Bordeaux is one hour. Each airport has car hire available. Tariff for 2018 ~ only $1050 per week (from Saturday to Saturday only) April, May, June, September and October ~ only $1200 per week high season July and August.